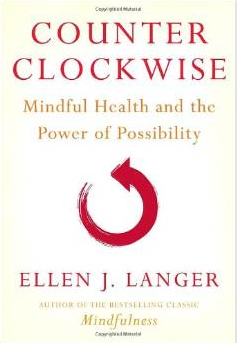 I’m reading a great book, Ellen Langer’s Counter Clockwise: Mindful Health and the Power of Possibility. It’s about being more mindful in everything we do and how that breaks through many of our assumptions and beliefs and can help us maintain and attain greater health, and happiness. It’s about thinking about our health, and aging, differently, turning our own stereotypes on their head, and taking back much of our power. It’s about how language either empowers or disempowers us, and sets us down a path of expectation, and how we then tend to create what we expect. Langer, a social psychologist and teacher, has written a book, this is actually her fourth on mindfulness but first on health, that is philosophical in part, and practical throughout. It is based on many of her studies and those conducted with her students. One classic study Langer conducted had senior citizens, some of whom were in nursing type facilities spend a week living as though it was 1959 again, wearing the type of clothes they wore then, doing things like carrying their own suitcases, which they hadn’t done in years, bringing photos of who they were then and “acting as if” they were their younger version, again. A week later, most were actually livelier, stronger and healthier, they expressed more vitality and took more interest in life than they had in years. 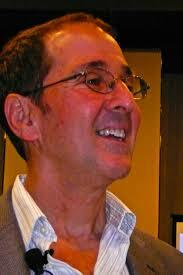 Langer pokes through our routine thinking as in where did these thoughts come from? Do they make sense? And she beseeches us to be mindful, to notice new things. And she reminds us that our routine thinking may indeed be deteriorating our health rather than vitalizing it. For instance she proposes that maybe older people are thought to have poor memories not because they lose their faculty to remember but because they’re not much interested in what’s going on in a world geared for younger people. So they don’t pay attention. What looks like memory loss may be a case of older people never having listened to something to begin with because it doesn’t interest them. Or maybe older people seem weaker because we’ve been socialized to see them that way, and they’ve been socialized to expect they will become that way. Maybe 80 year olds have trouble getting out of a car not because they’re feeble. Maybe cars just aren’t built for 80 year old bodies. Langer and her students’ experiments will offer you lots to reconsider that may change how you think which may impact your health more positively. Counter clockwise tests many of our assumptions about healthfulness and reading it would be a very healthy choice. This is something I was going to post over the weekend until Saturday night I exited my friend’s car and walking down her block, where a lot of construction was going on, twisted my ankle. I twisted it so badly that an hour later I felt like my foot had been run over by a truck. Since it was Saturday night and I was not at home, my friend went out to a neighborhood drug store to buy pain relievers. I spent the next two days basically with my foot up and being waited on. Alas, all dreams must come to an end, and I returned home last night to fare for myself. The ankle still needs rest, the pain relievers continue although at a lower dose, and I’m still wondering if my 2-day blood sugar rise was my body’s reaction to the stress or the excess unbelievably delicious whole wheat peasant bread I was gorging on all weekend at my friend’s house. Guess I’ll know soon enough now that I’m back in my bread-less house. Proof positive, 35 years after getting diabetes every day comes with episodes and more questions. O.K. that out of my system, this is what I wanted to post if there’d been no drama this weekend. I was watching Oprah last week and she had on Dr. Oz, heart surgeon and one of her resident experts. He was talking about quitting smoking. While I don’t smoke, I was intrigued to see if Dr. Oz would offer any advice that would be applicable to diabetes. I was not disappointed. Here are a few transferable actions you can take to improve diabetes management. 1) Pick a quit date – that might be the date you will chuck the junk food out of your house or quit eating as much refined carbohydrates like white rice, white potatoes, pasta, white bread. But what’s important is to pick a date. 2) Prepare yourself mentally, physically and socially – In other words decide how you’re going to handle it when you go out to eat with friends and they’re ordering desert and you’re in conflict. Know ahead of time you’ll just have two bites, for instance. If you’re starting an exercise program, what will you do if the weather’s bad and that curtails your walk? Have a back up plan. 3) Make 2 lists – Write down all the reasons why you want to improve your management, what will you gain? Then write all the reasons you don’t want to improve your management, what do you get to keep? Compare lists. What conclusions do you draw? Write them down and review them when your motivation flags. Above all, Oz advised to take it one day at a time, one hour at a time. He went on to say, phrases like “Don’t Smoke!” just make you think about smoking. Like don’t think about a pink elephant. Like “don’t eat cake.” Instead tell yourself the advantage of not smoking like “Breathe Free.” It keeps your mind focused on what you want. So I think phrases like “Don’t have that incredible, chocolate cheese-cake covered with lip-smacking raspberry sauce” is probably not helpful. If you replace that with, “I’m going to look fabulous at my friend’s wedding next month!”I think there’s a much better chance you will. I think Dr. Oz’s smoking advice makes sense for any behavior change you want to make and his admission that we don’t feel on top every day takes the pressure off. Normally I’d be really pissed off that I can’t take my daily power walk because of my ankle. But I’ll accept that some days are just not as good as others. Moreover, if I feel really sorry for myself by tonight, Ill only have one bite of my beloved gingerbread and put the rest away remembering that I’d rather have another year on the planet than another piece of gingerbread.